Coalition by-laws require the corporation to hold an annual meeting, with reports to the membership, election of a governing body, and the conduct of other business as needed. In 25 years of assembling people with common objectives from all corners of Maryland in one place, this event has evolved into a successful one-day affair open to all. In addition to conducting business, a typical Coalition annual meeting features interesting speakers, presentation of one or more Periwinkle Awards, a silent auction and sales booth, and of course a guided visit to a nearby historic cemetery. The meeting is traditionally held in late April or early May, likely to appreciate periwinkle blooms and note the close of the General Assembly session. In the course of 25 years, the Coalition has convened 6 times on the Eastern Shore, 13 times in Central Maryland, 5 times in Western Maryland, and 1 time in Southern Maryland. In recent years, the event title has widened to reflect its value beyond an annual business meeting. Open Forum is a popular time for attendees to ask questions of the group, to reflect on experiences—both good and bad, and to renew old acquaintances. We have fun, eat well, learn from each other, and enjoy counting “I Brake for Old Graveyards” bumper stickers lined up in the parking lot. 27th Annual – 2018: Sheppard Pratt Conference Center, Towson, Baltimore Co.
26th Annual – 2017: St. James Episcopal Church, Lothian, Anne Arundel Co.
25th Annual – 2016: Belmont Carriage House, Elkridge, Howard Co.
24th Annual – 2015: Shrine of St Anthony, Ellicott City, Howard Co.
23rd Annual – 2014: Poplar Hill Mansion, Salisbury, Wicomico Co.
22nd Annual – 2013: St John the Evangelist, Forest Glen, Montgomery Co.
21st Annual – 2012: Christ Episcopal Church, Columbia, Howard Co.
20th Annual – 2011: Apples Church, Thurmont, Frederick Co.
19th Annual – 2010: Kent Island Inn, Kent Island, Queen Anne’s Co.
18th Annual – 2009: St. George’s Church, Perryman, Harford Co.
17th Annual – 2008: Sandy Spring Museum, Sandy Spring, Montgomery Co.
16th Annual – 2007: New Windsor Conference Center, New Windsor, Carroll Co.
15th Annual – 2006: Holiday Inn, Ocean City, Wicomico Co.
14th Annual – 2005: Glenview Mansion, Rockville, Montgomery Co.
13th Annual – 2004: Tidewater Inn, Easton, Talbot Co.
12th Annual – 2003: Clarion Hotel, Hagerstown, Washington Co.
11th Annual – 2002: Blue Point Restaurant, Ellicott City, Howard Co.
10th Annual – 2001: Cecil County Historical Society, Elkton, Howard Co.
9th Annual – 2000: Evangelical Lutheran Church, Frederick, Frederick Co.
8th Annual – 1999: Charles County Community College, LaPlata, Charles Co.
7th Annual – 1998: Christ United Methodist Church, Salisbury, Wicomico Co.
6th Annual – 1997: Miller Library, Ellicott City, Howard Co.
5th Annual – 1996: Cumberland, Allegany Co..
4th Annual – 1995: Holiday Inn, Annapolis, Anne Arundel Co.
3rd Annual – 1994: St. Thomas Episcopal Church, Hancock, Washington Co.
2nd Annual – 1993: Ocean City, Worcester Co.
1st Annual – 1992: Columbia Hilton, Columbia, Howard Co.
Once again donations will be needed for our silent auction that is held during the Annual Meeting! 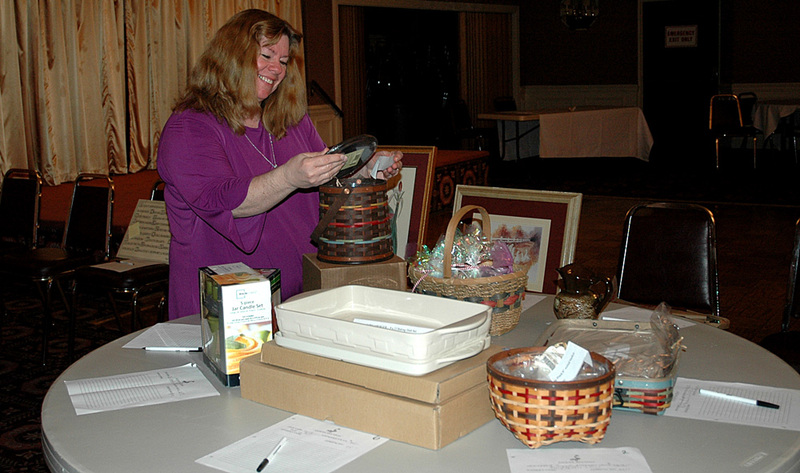 The key to a successful silent auction is having a variety of items available during the Annual Meeting. So it is not too soon to put aside any new or gently used articles such as cemetery-related items, plates, quilts, trains, candles, seashells, picnic baskets, gift baskets, etc., that you could donate for use in our silent auction! Your items can be brought to the annual meeting or for more information you may contact Sandra Wright via our online contact form. Please fill out and submit a Silent Auction Donation form for each item donated. How will item reach CPMBS by May 2?